Some members of Cowley College’s Student Patrol will be sporting a new look beginning this semester. Cowley College’s Student Patrol is a unique program that combines four courses of learning in which students learn patrol related activities and procedures. 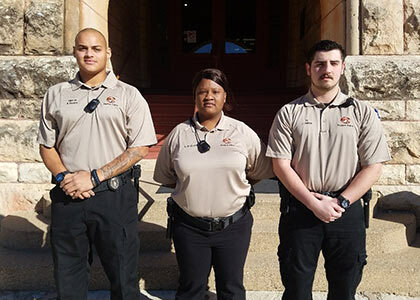 During their freshman year students participate in nightly patrol assisting Arkansas City Police Department with security of the downtown business district and they also assist in security of campus buildings. During their sophomore year they train the new freshman and also conduct internships with local law enforcement agencies. Through the Student Patrol program students are required to attain knowledge of law enforcement laws, concepts and trends. As members of the Student Patrol students are required to wear traditional police style uniforms. The current uniforms have been utilized since the mid- 80s. There currently is a trend in law enforcement towards more comfortable and relaxed looking uniforms. Recently students in the program expressed a desire to try and be more reflective of the uniform trend and come up with something new while continuing to honor the traditional style of uniforms. The students researched materials, styles and colors so that they could be distinguishable from local emergency services and yet recognizable as Cowley representatives. The decision made was that students with the freshmen patrol would continue with the traditional style of uniform and upon completing the freshman phase, sophomores and training officers would begin wearing the soft uniform. The new look will feature tan colored shirts with the Cowley tiger logo and “Student Patrol” embroidered on. The student officer’s name will also be embroidered on the shirt. The uniforms also meet most agency requirements for ride-alongs. The uniforms were obtained solely through student’s personal funds. Pictured from left to right are student officers Bryce Kinsey, Aniya McGowan, and Josh Atkins.